On Dec. 3, the Oklahoma Transportation Commission approved the single largest highway work contract ever in the history of the Oklahoma Department of Transportation. The up to $105 million project will complete the widening of the I-235 corridor in Oklahoma City from north of N. 50th St. to N.W. 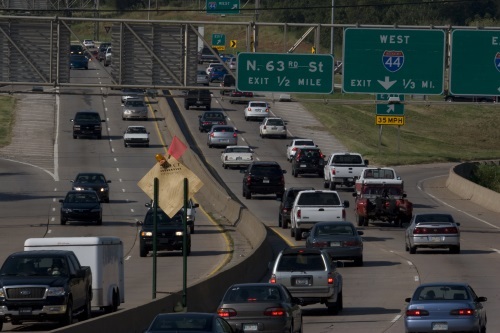 63rd St. and reconstruct the junction of I-235 and I-44 to a multi-level interchange with flyover ramps, the commission noted in a statement; an interchange that is one of the state’s busiest, with about 200,000 vehicles navigating the area each day. The eight-member commission also awarded several other highway contracts, including: a nearly $26 million project to reconstruct three miles of US-59 near Watts in Adair County; a nearly $17.6 million project to reconstruct eight miles of SH-53 near Springer in Carter County; and a more than $12 million project to reconstruct nearly four miles of US-270/US-183 in Woodward County. The commission also awarded a nearly $4 million contract to reconstruct one mile of Britton Rd. in a town called The Village using federal and local funds. Altogether, the commission voted to award 32 contracts totaling more than $194 million to improve highways, roads and bridges in 24 counties. A list of all awarded contracts can be found by visiting www.odot.org/contracts, the group said.